A diver training centre has secured £1.5m of public money towards its £5m improvement and expansion project. 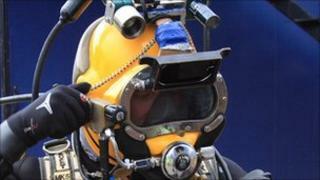 The Underwater Centre in Fort William said the programme would create 20 new posts and safeguard 53 existing jobs. Development agency Highlands and Islands Enterprise (HIE) has awarded the £1.5m. The site trains divers and remotely operated vehicle (ROV) pilots for work in the oil and gas industry and also the marine renewables sector. Owner Finlay Finlayson said the expansion project included improving a pier and bringing in a new diver training barge. He said: "With a growing oil and gas industry and a new focus on marine renewables, improving the training for divers and ROV pilots is going to be fundamental for us to take real advantage of these opportunities. "This is the largest investment we have ever undertaken and we are grateful for the support of HIE." David Oxley, head of operations for HIE in Fort William, said the centre was a world leader in subsea training. He added: "It already has a strong reputation for the quality of training it delivers and this expansion will allow the company to not only be at the forefront of the market in the UK, but the world."